Natural Dye Workshop with Michel Garcia and Sustainable Dye Practice | A film series and discussion forum dedicated to the science and practice of natural dyes and pigments using sustainable methods. A project of World Shibori Network, affiliated with Slow Fiber Studios. Michel Garcia, a world-renowned dyer, phyto-chemist, and botanist, and Yoshiko ​I. ​Wada, Slow Fiber Studios founder and producer of the Natural Dye Workshop film series, introduce sust​a​inable dye methods without conventional mordants, and unique direct application of natural dyes inspired by ancient traditions. Filmed in Brittany ​by Studio Galli Films, the workshop shows simple extraction and vat methods using different types and forms of indigo plants including dried leaves and sukumo (compost), and how to sustain the vat and use it. Natural Dye Workshop 4 – Trailer from Andrew Galli on Vimeo. This organic indigo vat method was originally introduced by botanist and chemist Michel Garcia. Natural, organic indigo (i.e. from an indigo plant) is not toxic. However, many dyers use harsh chemicals such as sodium hydrosulphite or thiourea dioxide to quickly prepare their vats. In addition, they may use synthetic indigo. Michel’s sustainable method yields a vat which is just as effective using organic ingredients. Organic Indigo Powder is available on Slow Fiber Studios Shop. Commonly known as “Lacquered Silk” or “Mud Cloth”, Gambiered Silk is a traditional fabric used by Hakka people in Guangdong, China. This fabric is light, transparent, waterproof as well as enduring. It is naturally-dyed and gets softer as time goes by. Black Gambiered Silk (also called chou zai, liang sha in south China, or bamboo sha in Beijing) is now universally called xiang yun sha throughout China. The technique of dyeing xiang yun sha in Shun De was added to Intangible Cultural Heritage in China in 2009. 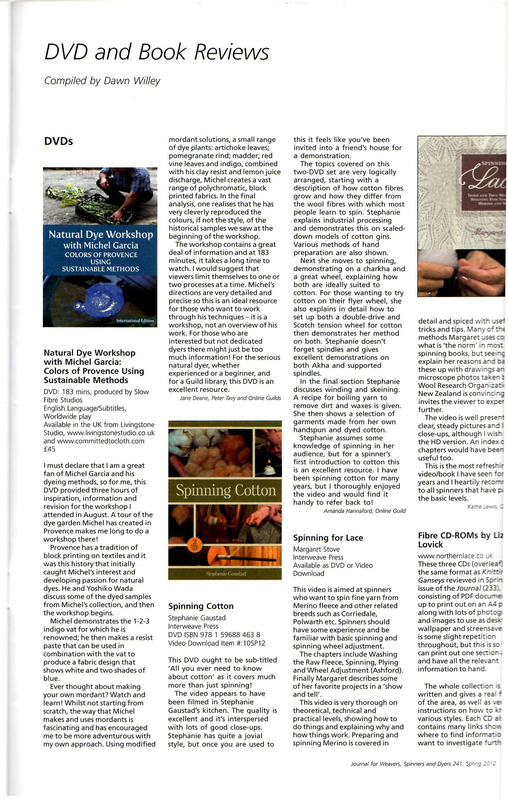 Ming Pao Weekly featured a cover story titled “Xiang Yun Sha – The Path of Textile Dyeing Technique Development in South China”. This article outlines the gambiered silk’s history, the process and the contemporary application today in Fo Shan and Shun De, China. Included with the article are beautiful photographs and illustrations highlighting the few studios and workshops which still produce the deep brown xiang yun sha (香云纱) featuring interviews with makers, designers, and students. Download the English translation of the article < here>. The Ming Pao magazine ( including actual Gambiered Silk swatches ) can be purchased < here >. The 9th International Shibori Symposium held in China, 2014 featured a Gambiered Silk Fashion Design Exhibition. Each invited artist was given 10 meters of various types of the traditional natural dyed gambiered silk, in order to create a unique and contemporary apparel design application. These designs display effective results of manipulating the function of the silk and challenge everyday structure and form. Some of the work is featured below. The Natural Dye Showcase is a national, juried exhibition highlighting excellence in contemporary use of natural dyes. The juror, Yoshiko I. Wada chose 47 works by 35 fiber artists for their merit as works of art and for the artists’ skillful knowledge of the chemistry of natural dyes. The Main Gallery will be devoted to this exhibition, with an opening reception on Second Saturday, August 8, 5 pm to 8 pm, preceded by a gallery talk by Yoshiko I. Wada at 4 pm. All the works selected use fibers treated with natural dyes – indigo is used in many pieces, along with two dozen other dyes derived from plant, mineral, and insect sources. The works have been realized with a range of fiber techniques, such as tapestry and other weaving methods, shibori, sashiko, basketry, and embroidery. The finished pieces include wearable art as well as wall hangings, sculptural pieces, and book art. 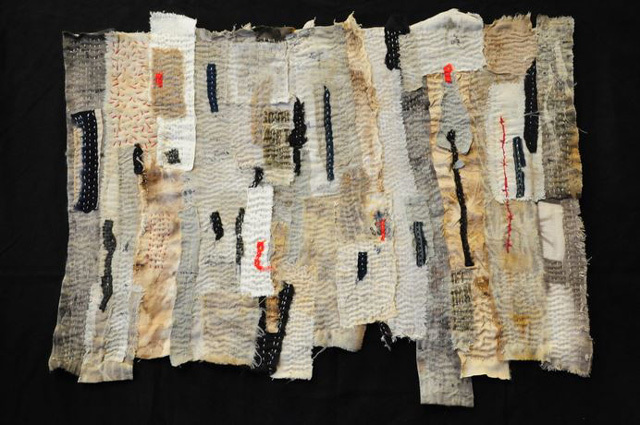 There are 18 California artists represented, along with fiber artists from 13 other states, including WSN members Catharine Ellis and Barbara Shapiro. Juror: Yoshiko Iwamoto Wada is an artist, author, exhibition curator, textile researcher, and film producer and has long been an exponent of traditional and sustainable practices in fashion and textile production. She travels throughout the world giving lectures and workshops, and participates in conferences to build greater insight into the world of fiber and textiles. She is president of the World Shibori Network and founder of Slow Fiber Studios. 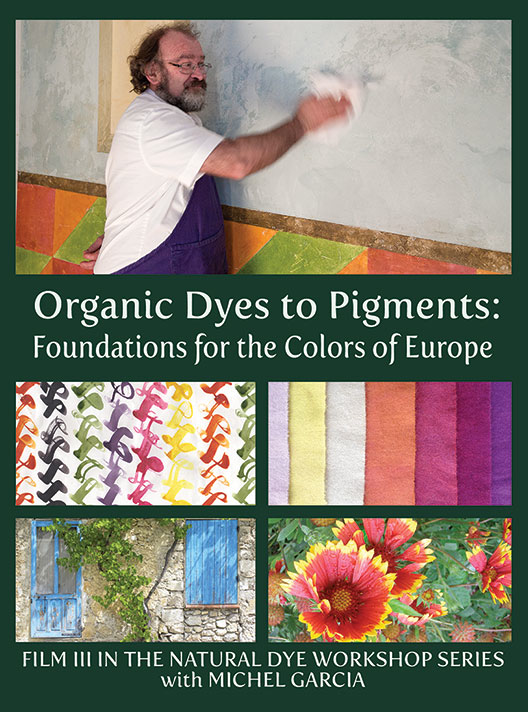 The third film of the series,”Organic Dyes to Pigments: Foundations for the Colors of Europe” Order here. Trailer – Natural Dye Workshop 3: Colors of Europe from Slow Fiber Studios on Vimeo. Botanist-chemist Michel Garcia takes us on a wondrous journey, sharing his keen insight as one of the leading natural dye experts of the world. Michel’s approachable instruction demystifies the natural dyeing process; he offers a rare glimpse into what makes plants tick. Learn updated versions of traditional dye methods – once laborious and polluting – now revised into simpler, safer modern recipes sensitive to issues of sustainability. A worthwhile film no matter your area of interest or level of skill — appealing to dyers, textile enthusiasts, and really anyone interested in how things work in the natural world. Viewers learn how to use natural raw materials wisely and artistically.